As we were leaving, we asked one of the people working there about catching a bus back to the area we needed to reach. The information and instructions were a little convoluted, so we ended up walking back down Lambeth Road, crossing the Thames on Lambeth Bridge. We never did see the bus we were supposed to catch during the whole time we walked back, so I guess we ended up saving time and money. The main drawback was that Susan’s foot was hurting. She will be having foot surgery when we get back to Atlanta. 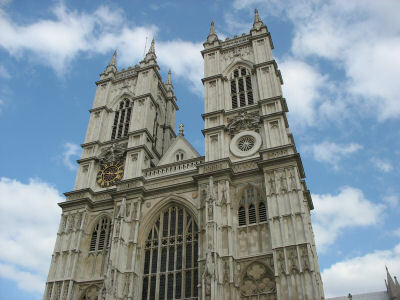 After crossing the river, we walked along the waterfront, then turned down a side road trying to find Westminster Abbey. We wound our way through the streets until we reached the church. Perhaps I was a bit naïve, thinking that admission to the church was free. I couldn’t help but wonder how God would feel about charging people to go into the church. Anyway, we paid £10 per person and walked into the church. No pictures are allowed inside. The architecture of the church is majestic and awe inspiring. I can certainly understand why thousands of people are drawn here each year. The Abbey, built around 1050, is the coronation site for Britain’s monarchs. Everywhere you look are the remains of 3,300 kings and nobility, church members and other people of import. Elaborate sarcophagi and monuments are a veritable history book dating back hundreds of years to the founding of the church. Soon after we started walking through the many hallways of the church, I saw that the gate had been closed behind us. They must have closed the doors at four o’clock. In the last room, I noticed several people seemed to be gathering around a particular monument. I figured it must have had some importance, and only realized why when I was watching the Da Vinci Code on the plane trip home (my first time to see the movie). The monument was in a scene from the movie. The actual scene was not filmed in the Abbey, as some research I did revealed that the Church denied access to the filmmakers based on the Church’s denouncement of the book’s unsound theology. We exited the Abbey about 5 p.m., and immediately went into the gift shop. It was a busy place and had a number of interesting items related to the church and to London. Susan bought a couple of items, then we left. We decided to go back to the hotel and rest for a while. We passed Big Ben and took pictures of it. 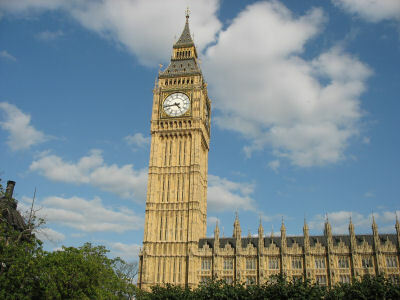 Did you know that the Clock Tower is not actually Big Ben? Big Ben is the main bell inside the tower. You learn something new every day. 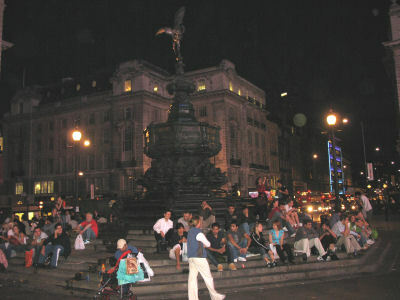 We rested at the hotel until about 7 p.m., then walked to Piccadilly Circus. No, there are not any elephants or clowns. “Circus” refers to the traffic circle. This is a very busy part of London, with many pedestrians and vehicles whizzing back and forth. 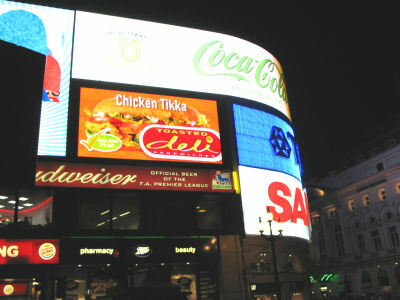 Much like New York’s Times Square, Picadilly Circus is ablaze with giant video signs. I’d recommend visiting at night for the full effect. Here you’ll find lots of shops and restaurants. We chose to come here because there’s a Planet Hollywood restaurant here, and we had a 20% off coupon that we got out of The Original Tour (the tour bus we rode on) brochure. Yeah, I know. How cheesy can we get? 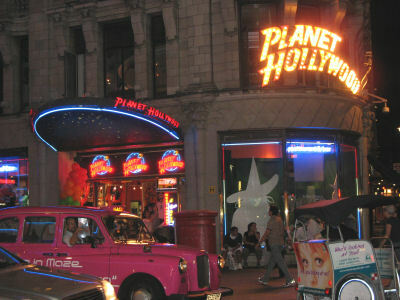 We’re in London with all these great pubs and other amazing restaurants, but we choose to eat at Planet Hollywood? Well, as I mentioned before, chain restaurants tend to have the kind of food and consistent quality that Susan and I like. Plus we had the coupon. So that’s where we went to eat. The restaurant wasn’t crowded, but it wasn’t empty either. They have many interesting movie memorabilia items on display, and there are giant screens throughout the restaurant showing movie clips and music videos. There was actually a VJ who was “spinning” the videos and narrating as the clips played. I ordered a hamburger with something special on it (I can’t remember now what was on it, so I guess it wasn’t that special). I know. Hamburgers are about all I have eaten. But I like hamburgers, so get over it. Susan ordered a bleu cheese hamburger, well done. I like mine medium. After we started eating them, we think that they cooked hers medium and mine well done. Our service was pretty good, but not amazing. We had one sticker shock: $16 for Diet Coke! We both ordered a Diet Coke when we sat down. I thought for sure that this American-style restaurant, which gives free refills in the Planet Hollywood locations in the US, would give free refills here. Our waiter came to the table about 2/3 through the meal and asked if we wanted another Diet Coke. We both were empty, so we said yes. When the final bill came, it listed four Diet Cokes on the bill, at 2 pounds each. That’s 8 pounds, or nearly $16 for 4 measly drinks! PLEASE! The total bill was £33.16, not including the tip. But the food was good and the atmosphere felt like home, so it was fun. We left Planet Hollywood and walked to several different stores nearby, looking for souvenirs. Susan picked up a few items, including some London-themed Christmas ornaments. We always try to buy at least one Christmas ornament that represents the city or place that we visit. It’s fun each year to put them on the tree and remember our trips. Crossing the street to visit another shop, I lost my mind temporarily and looked left instead of right, forgetting that they drive on the “wrong” side of the road here. Luckily, Susan grabbed my shirt and yanked me back, as two buses were headed straight for me. I really felt stupid, and vowed to not let that happen again. We walked to the actual circus, where all the lighted signs are and took some pictures. It’s a great place to people watch if you sit by the statue of Eros. Lots of people were sitting and talking there. Most of the night I had been obsessing about getting some ice cream. I considered going into some ice cream places, but the prices I could see were just too high. I didn’t want to pay 4 or 5 pounds for ice cream. Walking past a Burger King, I saw that they had sundaes for 1 pound, so I went in and ordered a chocolate. Unfortunately, they were out of the chocolate fudge, so I settled for strawberry. For a pound, I was happy, and it tasted great. We walked back to our hotel. It was about 8.45 p.m.
Back in our room, we watched The Bourne Identity (our second Matt Damon movie while in London). One thing we both found interesting and odd was that the movie was interrupted by the news. They would play the movie for an hour or maybe it was 90 minutes, then the news would come on for 30 minutes. Once the news was over, the movie concluded. I’ve never seen anything like that in the US. Also, on the various shows and movies we watched while in London, there were far fewer commercial breaks than US television. Perhaps the channels that are shown in the hotels are different from what the residents see in their homes. I don’t know. After the movie, we settled in and went to sleep.